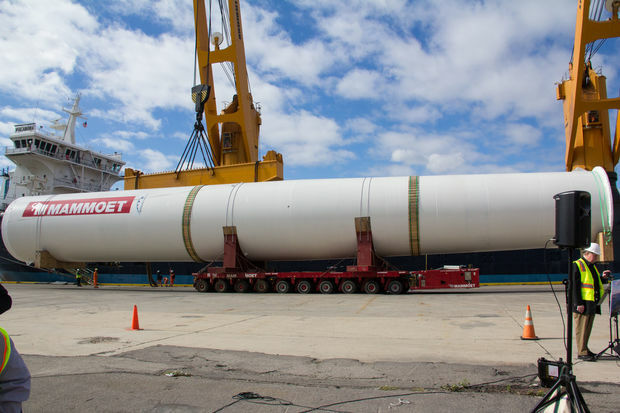 SUNSET PARK — The 2,200 ton legs that will hold the giant New York Wheel were unloaded in Brooklyn on Tuesday, where they'll stay until they're installed in St. George. The legs — which were broken up into eight, about 250-ton pieces — arrived at the South Brooklyn Marine Terminal early Monday morning after a 26-day journey from where they were built in Italy. "We've had lots of milestones up until now, but this is the first one where you can actually point to something that's going to be part of the wheel," said Rich Marin, president and CEO of the New York Wheel. "This is going is to be a big wheel and I think it'll be impressive and iconic and everybody will take a great deal of pride in it." The legs, made by the Italian firm Walter Tosto SpA, will remain at the terminal until their pedestals arrive from Montreal. Once the pedestals are installed, Marin expects the legs themselves to be installed in December. The project is still waiting for several other pieces to be made and shipped over from across the world, including the rim made in Turkey and the drive towers made in the Netherlands. Aside from some of the first pieces of the wheel to arrive, officials also touted that the shipment of the legs represent the rebirth of the South Brooklyn Marine Terminal. "This part of the incredible industrial heritage of Sunset Park and the Brooklyn waterfront," said Maria Torres-Springer, president of the city's Economic Development Corporation. "These pieces are really among the first cargo that's come into this facility really in over a decade." Crews have been working on the $500 million observation wheel — which will be one of the tallest in the world at 630 feet — for more than a year and it is expect to spin on the waterfront in April 2018. "Not too long in the future, whenever there's a film made in New York City, whenever there's a newscast made in New York City, that first shot is going to be of the New York Wheel," Staten Island Deputy Borough President Ed Burke said. "This is going to join those great icons of New York." This summer, workers finished laying the concrete foundation of the base to hold the 20-million-pound structure where the legs will be embedded. The project was first announced in 2012, was originally slated to open in 2015 but construction hit some bumps and the date was pushed back several times. Construction expected to be finished this time next year, but the developers pushed the date back again last month to April 2018 to give them more time to test the attraction's safety, Marin said. When opened, the wheel will move about 10 inches per second, won't have to stop to let passengers in and out and a ride will last 38 minutes, the developers said.